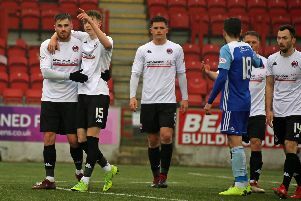 Clyde manager Danny Lennon was delighted with his side's fine win at Elgin - as they took advantage of a day off for promotion rivals Edinburgh City and Peterhead. The capital side and the Highlanders had been due to play each other last Saturday, but the match was postponed due to City's IRN-BRU Cup tie with Alloa. That gave Clyde the opportunity to close the gap on the two sides above them in the League Two table, an opportunity they made the most of with a fine 3-1 win at Elgin. Lennon said: "I think it was important with them not playing that we managed to capitalise and close that gap, albeit we’ve played a game more. "It’s a very difficult venue to come to in terms not just in terms of the quality Elgin have and how well they pick up points here, but also the distance, what time you’re arriving, the preparation. “We did that fantastically well. That starts with the chefs down at the club with a lovely breakfast and then there was a quality drive up. “It was fantastic to go and get the level of performance we did. We pressed the game and really put our mark on it right away. “We know that we played a lot of the game against 10 men and sometimes that can be difficult because players can start to take too many touches. “We hammered that home, to move the ball quickly and enjoy a bit of possession, even if it’s got to be in our own half, and pick the right moments to go forward and I thought we did that exceptionally well and controlled the game for 90 per cent. “It was great to see three different scorers and the amount of chances we created, but what really impressed me was the work ethic of the boys. “As soon we gave the ball away and there was transition we had red jerseys around there to win the ball back. “I’m really pleased. We controlled the majority of the game and in the final third could maybe have picked a better decision at times and maybe even had more." Clyde have no competitive game this Saturday due to their exit from the Scottish Cup, but will travel through to play East of Scotland League side Linlithgow Rose in a friendly. Kick-off at Prestonfield is 2.30pm and admission is £6 for adults and £3 concessions.